Compatible HP Colour LaserJet 131X Black and 131A colour rainbow bundle value pack of printer toner cartridges. Compatible HP 131X / 131 Printer Cartridge Page Yields : Black toner cartridge 2,400 pages. 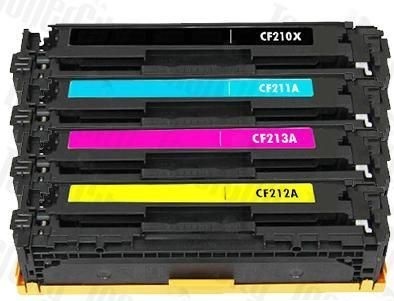 Colour toner cartridges, Cyan, Magenta & Yellow, 1800 pages per colour. 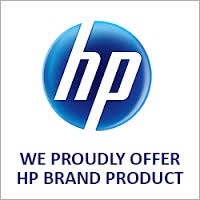 Manufacturer & print quality guaranteed Compatible for use with HP Colour LaserJet Pro 200, mfp, M251, M251n, M251nw, M276, M276n, M276nw printers. Any small office can reduce printing costs by utilising our compatible 131A, 131X toner cartridge set value pack. The compatible HP 131X, 131A value pack is sold at a discount to purchasing cartridges individually saving time and money. You can still create bold and impressive results with crisp colour graphics and black text using our HP alternative CF211a, CF212a, CF213a, CF210x toner cartridges for Colour LaserJet M251 and M276. printers. Affordable high quality printing you can rely on and page yields comparable to HP new, Black 2,400, Yellow, Magenta & Cyan, 1,800 per colour cartridge.